This paper is organized into sections describing the importance of IT infrastructure security and presents essential criteria IT leaders should use to identify end-to-end server security. 1. Trust and the Modern IT Infrastructure Why you should be concerned about server security (or the lack thereof). 2. 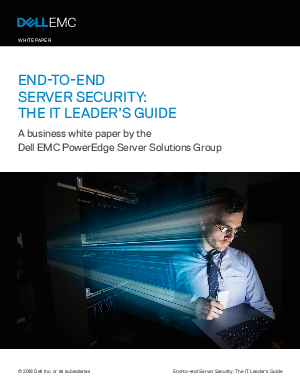 End-to-end Server Security How Dell EMC defines end-to-end server security. In this section, we also provide crucial characteristics business and IT leaders can use to classify prospective server vendors. 3. Key Security Criteria for the Modern IT Infrastructure The security questions every IT leader should ask of their server vendor before embarking on an IT transformation. The objective of this paper is to highlight the Dell EMC comprehensive approach to server security. PowerEdge servers come with security built-in, not bolted-on. Using a Cyber Resilient Architecture, Dell EMC commits to end-to-end server security on all PowerEdge servers. That means we focus on often-overlooked security features at the firmware and hardware level. In addition, PowerEdge servers come with standardsetting security spanning the IT security lifecycle according to the NIST Cybersecurity Framework. On a PowerEdge server, security is a standard, not just a set of features.